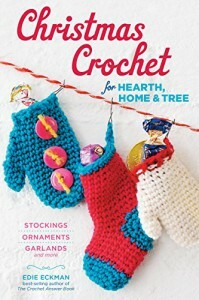 Christmas Crochet for Hearth, Home & Tree: Make Your Own Stockings, Ornaments, Garlands, and More - Edie Eckman - review - Books! I loved it! There are so many cute ideas in this book, and ideas that are different than what I have seen in other Christmas crochet books. There is a huge variety of Christmas stocking patterns, ornaments, tabletop decorations, garlands, a tree skirt... And more. The directions are great. For each pattern the specific stitches required are explained within the pattern (so you won't need to flip back and forth from the pattern to a special stitches section of the book). The directions are mostly written, but some patterns or portions of the pattern are also written in chart form. 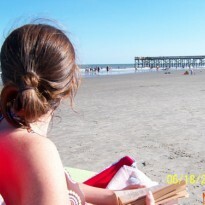 Some patterns include special directions for right or left handed crotcheters. Each pattern also has a beautiful color photo. Near the end of the book there is a stitch and abbreviation glossary and some basic crochet tips and how-tos. One of the stocking patterns even shows how to personalize the stocking by stitching a name. I am excited to start making some Christmas crochet! I received this book from NetGalley to read and review.